I knew it, the cooling of the 60’s 70’s was also our fault. It was our pollution wot dunnit. It’s always our fault. Us….the life sucking parasitic vermin on the body of poor delicate pristine mother Gaia. Kill ’em all, kill all humans so that Gaia can be habitable once again. Pardon the emphasis, but it’s there to help the most illiterate among the warmists. (*) Peterson, Thomas C., William M. Connolley, John Fleck, 2008: The Myth of the 1970s Global Cooling Scientific Consensus. Bull. Amer. Meteor. Soc., 89, 1325–1337. lol, stupid memory hole malfunction!!! I read an article presenting an excellent literature search of peer reviewed articles back then showing global warming articles were predominate. 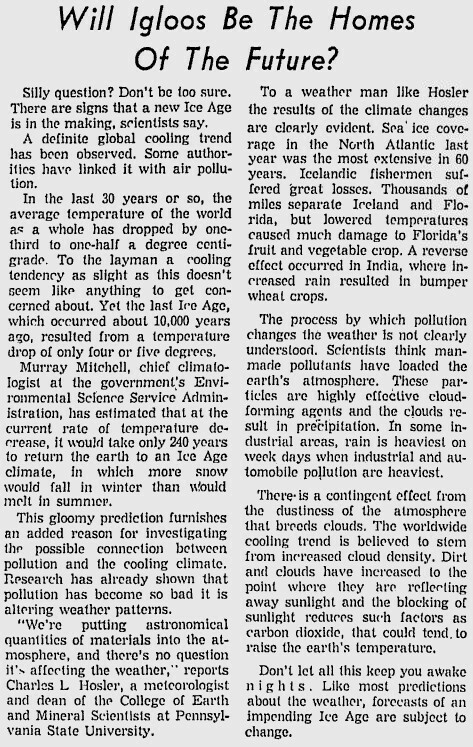 Apparently, global cooling was only hinted at by some scientists but was over endorsed by the media. Yet, global cooling is now happening with the Landscheidt solar minimum, a negative Pacific Decadal Oscillation and increasing cloud cover. We now know that the science of CO2 warming the atmosphere is flawed if not downright dishonest-over 200 ppm, very little additional warming occurs due to the flattening out of the CO2 absorption curve (temperature vs. ppm CO2). The concept of an atmospheric greenhouse effect is also flawed. In the troposphere, convection predominates over radiative effects. Basicly, the warming effects of CO2 have been wildly over estimated.